Volunteers from across Stoke-on-Trent are to be given a chance to help make this winter’s Christmas lights switch-on event among the most colourful ever. 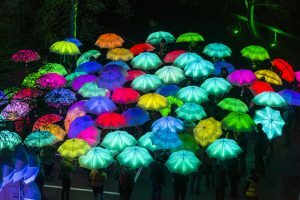 A host of technicolour LED-lit umbrellas will add a new twist to the traditional parade as Christmas kicks-off in City Centre Hanley on Thursday, November 19. This year’s lights switch-on will feature all the traditional elements of Christmas and more. High above Albion Square, on a single wire, a pair of wire walkers will play-out a heart-warming love story. The show will involve colourful pyrotechnics and a community choir of city residents – first featured in the Big Feast 2015 – and the bright array of LED umbrellas. Around 30 people are needed to perform with the LED umbrellas. To get involved, people should attend a rehearsal on Wednesday, November 18 (5.30-8pm) at Hanley Town Hall and be available for the switch-on event on the following day, arriving at the town hall at 5.30pm. “Christmas 2015 in City Centre Stoke-on-Trent is set to get off to a spectacular start,” said Appetite Director Karl Greenwood. “The City Council is planning a traditional Christmas parade for all the family to enjoy and this will be complimented by a thrilling high wire show and pyrotechnics from Cirque Bijou. To get involved, please contact Kat Boon by telephoning Appetite on 01782 381373 or by emailing kat@appetitestoke.co.uk.